Foosball Table Dimensions vary. Professional foosball tables are built to regulation statistics, while other tables are built at specifications depending on the use whether for homes or sporting clubs. This is not to say regulation size foosball tables are not used in homes or sporting clubs. Other tables are made to facilitate small children who are curious about learning to play the game. 2 What is a good Full Size Foosball Table? There are other foosball tables that are built to be folded and packed away in a closet, especially if you live in a small apartment, this will determine the size table to fit your small space. 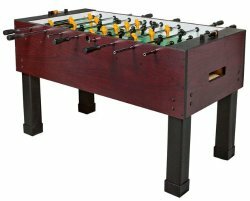 As indicated above, the Regulation-size Foosball Table with measurements of L 56”x W 30”x H 36” is a unique and very good investment piece of furniture to have. For installing this foosball table in a club room or bar you will have already had wide open spaces to play in, so the need for planning on space is not that great. Because of the dimensions of a regulation foosball table, players may choose to use certain professional stances while playing, so leg room is an important consideration. There will also be the advantage of enough space for rod movement of back and forward plays. Side ball return feature foosball table will enable the owner to have the option of placing the table closer to the wall and the availability of retrieving the ball quickly. Having a table with an end ball return will not enable you to position your table near the wall; your ball will probably fall out the side during play as well as having to reach around the side of the table for the ball. Having a game room does not necessarily mean you only want to have a foosball table. The table is the focus piece, but comfort is generally why you have a game room. You want to have fun while unwinding. A nice sofa, bar stools with bar, table for drinks as well as playing space is what makes for a good night of entertainment; you maybe want to add an old Juke Box for some nice old hits music to set the mood of play! The EastPoint Newcastle Foosball Table is one of the standard size foosball tables available on the market. It is an Official table which is used in tournaments and also ideal for your own personal game room. This foosball table works well with a foursome game or just with you and your special someone you want to impress with the game or just have fun. It is also ideal for youths and college players who want to rack up points or just work off some extra energy. 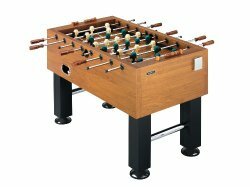 The EastPoint Newcastle Foosball Table is sturdy, with solid legs and fixed with oversized leg levelers to stabilize and ensure the table stays flat during play. The Rods are made from steel and have wooden handles for easy grip. The high-performance bushings enhance play by keeping the rods sliding and spinning so players can make those intricate and game-winning shots. This foosball table is quite attractive, as the playing field is made of particle board and finished with a Luster Long finish which keeps the surface dry in the event you have a spill during play. The table has an attractive playing surface with professional football field graphics on beautiful grass green color lint and decked out with robot-like playing men. Owning a Standard size Foosball Table of this brand is an excellent investment. Measurement dimensions may vary by about an inch or two with the three mentioned Table Top size Foosball Tables, but this does not take away from the level of play you will experience. They are designed with steel rods overlaid with chrome plating to enhance playing and easy sliding and spinning with the playing men molded to the rods for making intricate and strategic plays. The rods are fitted with rubber handles, grooved for a sturdy and comfortable grip, while the table legs are fitted with a nonskid, nonstick, nonslick rubber padding to protect furniture. Goalie positions are three men even though this is not a standard or regulation size table, and you are able to maintain and cover all your bases and corners during play. Because of the dimensions of this Table Top Foosball Table, children or toddlers can enjoy the game just as much as the adults. A Foldable size Foosball Table L 51.57” x H 33.86” x W 27.95” open measurement; closed measurement: L 12.99” x W 27.95” x H 66.93” are considered one of the most convenient foosball tables to be invented. The construction with the mechanisms for folding is easily manipulated in small spaces. This table is perfect for persons who want to enjoy the game while living in a small apartment. It is designed to be folded and put away in a closet or cupboard after use and is also convenient for an office or school to be used for recreational periods. Made with standard features and components as other foosball tables; you will be able to entertain and have fun playing on this table. Foosball Table Dimensions whatever the table brand or manufactured, will not take away from your playing skills, or enjoyment. In fact, it will certainly enhance your playing skills so you are able to have and give an exciting game. However, before choosing a table make sure to check for the right Foosball Table Dimensions. What is a good Full Size Foosball Table? Your game room is never complete without a foosball table. Acquiring a full size foosball table is the optimum of games that will bring prestige to your game room. Planning to get a foosball table is a job that requires some specific measurements. The measurements for the game room must take into consideration the dimensions of a full size foosball table. The full size foosball table is generally 2 ½ feet wide and 5 feet long. That is 30 inches wide and 60 inches long; which is how big a full size foosball table is. Now, think about those dimensions and then plan your game room. This must also take into account rods sticking out from both sides of the length of the table; as well as room for energetic playing for both adults, and energetic teenagers. Kids must not be left out, as they are going to want to get in on the action, and fun that is always had when playing a great game of foosball. The dimensions of a regular foosball table are generally 30 inches wide by 56inches long, so you can imagine the extra 4 inches that you will need to accommodate when buying a full size foosball table. These tables are all regarded as amongst the best foosball tables you are ever going to find that will meet your standards if you are an expert player, or you are a foosball lover. The quality is guaranteed by the various manufacturers and will ensure you get exactly what you pay for. This foosball table will be one of the best investments you will ever make when purchasing your table for your game room. This Foosball Table is considered a classic in foosball tables. It is manufactured in dimensions of 54.75 x 34.5 x 30.75 inches and weighs in at a whopping 186 pounds. This table is sturdy, has 5-inch square legs with chrome tube cross bars to ensure stability with leg levelers to facilitate play on any surface. The Chrome plated, steel rods are designed for smooth and precise play with the octagonal wooden handles. There are also side ball return features along with three goalie player set up. The accuracy and confidence that this Harvard- Mid fielder table command is comparable to no other; as described by an owner, it is a solid table for a game room. Purchasing a Tornado Sport table for your game room is also another great investment. Firstly this Tornado table weighs 205 pounds. The heft alone is an indicator of the quality table you own and then the dimensions that the manufacturers have made this foosball table are worth it. They are 56 x 30 x 36 inches which are L x W x H. This table is considered the perfect addition to any well-stocked game room and is a great for professional and armature players alike. Kids of teenage years and even younger will enjoy a good competitive game on this foosball table. The table is used by many professionals and is certified by the world championship foosball federation of the USA. A great quality table and made of Melamine Mahogany 1 inch thick cabinet and sturdy legs with leg levelers. This foosball table has gotten a 5 Stars rating from over 28 proud owners, who have considered it their duty to recommend this prestigious table. For families that have game rooms, incorporating a foosball table as one of the games you choose to play and have fun is the best decision you will make. Soccer is a great pastime and for those who need to have that game with them at all times, even off season, playing foosball is the way to go. A full size foosball table will give you your friends and family hours of fun, especially if you rate yourself to be as good as the professional players. Teenagers will find the game a well-needed route to letting off some steam and bonding with friends and family. Armatures are more eager to learn the game when they see the so-called professionals and professionals having so much fun. 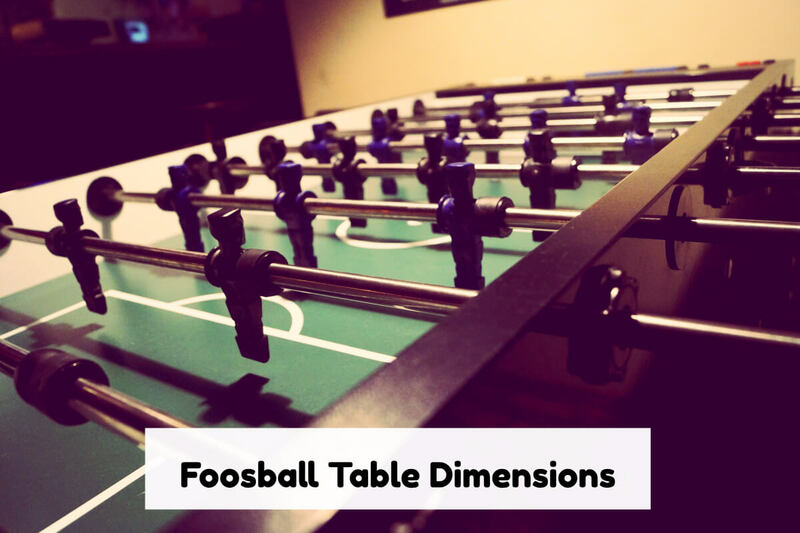 As mentioned earlier; when planning a game room and to incorporate a foosball table as the main game choice, you need to remember all the dimensions that the table entails. Along with the size of the room built, which needs to accommodate table size, playing space for players, especially if some of your energetic friends are tall 6 footers. The weight of the table makes it a great foosball table for very energetic play. The surface of your game room must be workable with the table legs as the leg levelers (if manufactured with these) must be able to settle comfortably during play. The harder to move the better, as this ensures uninterrupted playing. Some owners recommend sliders if you want to move the table for storing. Personally, I would build the game room to accommodate the foosball table in its own space, so no moving for storage is necessary. Just remember care, which means covering the foosball table to protect it from dust and any possible moisture. The full size foosball table once owned is a great investment and will be the center of many family gatherings for many rears. Cost is relative when compared to the fun you will have playing on this very professional ranked table. The hardest part is assembling but the years of fun are worth it.